Inside the camera is a 16-megapixel Four Thirds sensor alongside a Qualcomm 8-core processor. 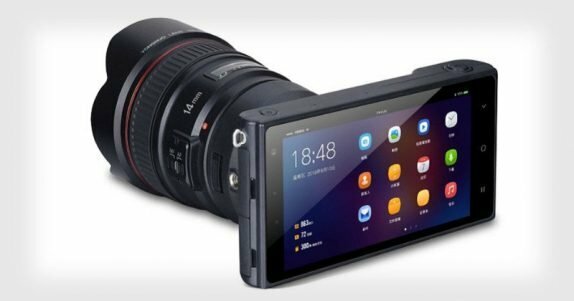 The camera will run Android 7.1 for its operating system and have 3GB RAM and 32GB storage (as well as up to 32GB of expandable storage). In addition to 16MP rear photos (with RAW functionality), the camera can also shoot 4K video at 30fps and 8MP front-camera photos. On the back of the camera is a 5-inch 1080p multi-touch display. Other features and specs include a stereo mic, GPS, a 3.5mm headphone jack, dual LED flashes, and a 4000 mAh battery. While most of the specifications are similar to a smartphone, the fact that it supports DSLR lenses and a large Four-Thirds sensor makes the YN450 special. The company is currently running a ‘Who Am I’ naming contest allowing users to give it a name. There’s no word on the pricing and official launch, so stay tuned for further details.